We picked up a Rostock Max V3 like this, which is 11 hours into a continuous cross-section fractal print (cool print!). 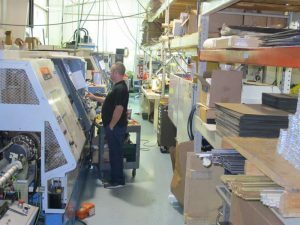 Yesterday we made a trip to SeeMeCNC in Goshen, Indiana to get a large format Rostock 3D printer kit from the manufacturer. 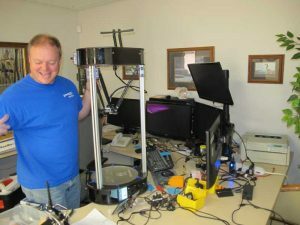 SeeMeCNC began as Blackpoint Engineering 20 years ago, but got into the open source 3D printing world early on and began making 3D printers as SeeMeCNC in 2011, their primary business today. 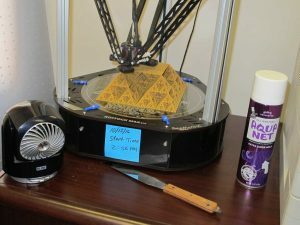 Their main product line is a series of 3D printers based on the delta robot design, versus the more traditional Cartesian design in most RepRap style printers that uses XYZ coordinates. Nathan, their master machinist, programs a CNC machine that is making parts for their extruder/hot end. 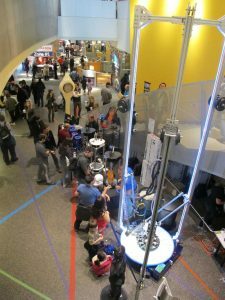 SeeMeCNC embraces the open source design movement. Their design information (both hardware and software) is readily available and the active user community helps to improve it. They also make the parts right here in Indiana. Once you see all the equipment jammed into their facility, you realize this is not a firm that buys different parts and boxes them up; they actually design and make their own parts to have parts designed for each product and to have better quality control. 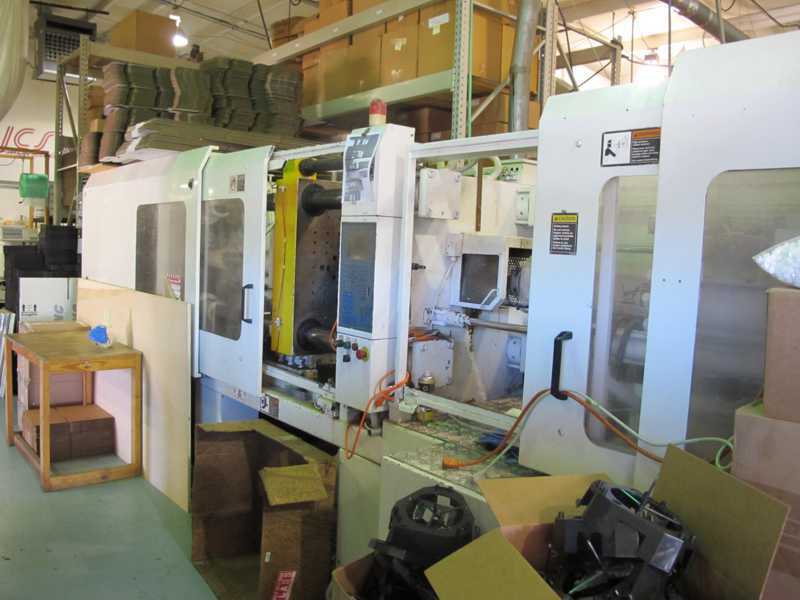 Their largest injection molder, there are two smaller Niigata machines that also get used. SeeMeCNC makes their dies for the molded parts inhouse. We currently have a member loaned Printrbot Metal Simple that is an awesome compact printer, but wanted something for the makerspace that offered a little larger build area. A delta robot design is a different design that most of our participants have seen (except for Travis who sells 3D printer parts). We chose the Rostock Max V3 printer, which has a build area of 275mm dia. by 400mm tall (10.8”x15.7”). The SeeMeCNC Rostock line is well proven; the new version adds an accelerometer probe on the hot end plus significant fan and heater improvements. They’re transitioning over from the V2 due to simplified parts and reduced assembly time. A really big delta robot printer at the NYC World Maker Faire. Yes, the street clock in the distance was 3D printed! Thanks to JJ in engineering who gave us a great tour. We’ll be putting the unit together over the next week or two (if we can wait that long!). Join us or come to one of the open shop nights on our events page – we’ll be glad to show it off! 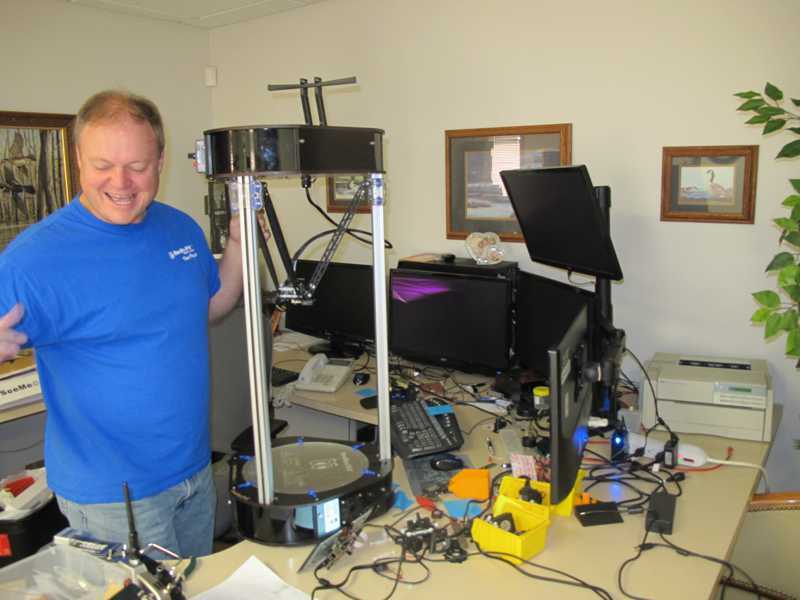 Steve “PartDaddy” shows off a newly assembled Rostock Max V3 on his desk. 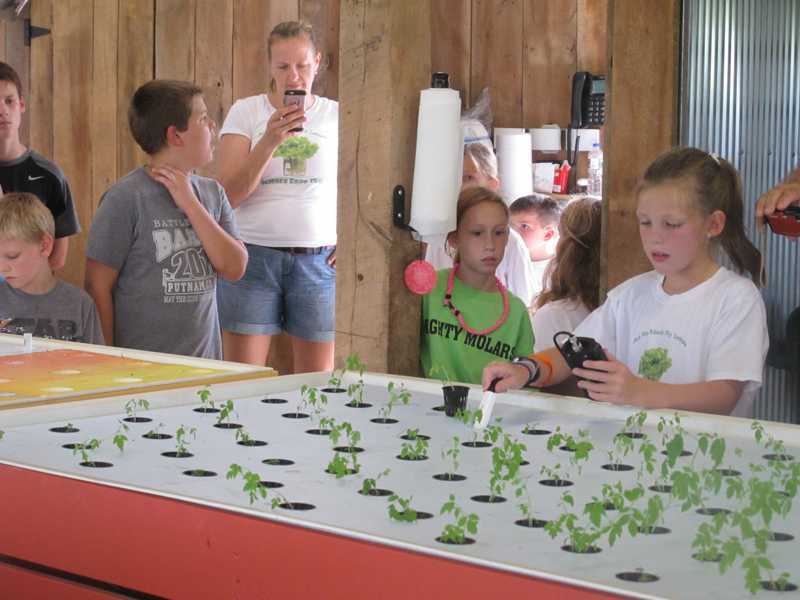 Inside Airy Knob Farms Hydroponics Concept Lab. After the interest in the Subaru Indiana Automotive tour, a group of Castlemakers went on a tour of a Hydroponics Lab at Airy Knob Farm just outside Greencastle last month. The ½ hour tour, which was a science project for Victor & Linda Hunter’s grandkids, went over the basics of hydroponics in their proof of concept center for growing fruits & vegetables year round. 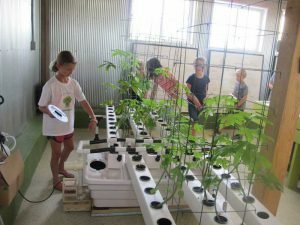 There is a pretty big ‘concept center’ with over 500 plants growing when we visited & the kids did an awesome job with the tour. After placing seeds into rock wool cubes, they are inserted into the ebb-flow growing unit. Hydroponics grows plants in a mineral rich water solution without any soil. Because the plant’s roots don’t have to use energy seeking out nutrients, most of the growth goes to top portion of the plant with the root ball being significantly smaller and a much bushier, more compact plant. Supplemental lights often help that growth when it’s used in practice today (hydroculture goes back to Babylonian times & the 1600’s in Germany). 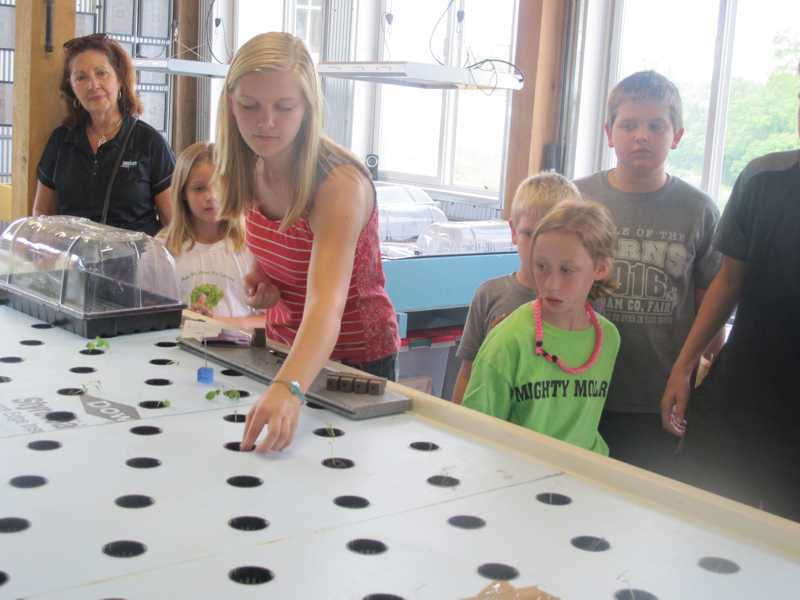 One of our hosts show how water/nutrients are added to a nutrient film hydroponic system. 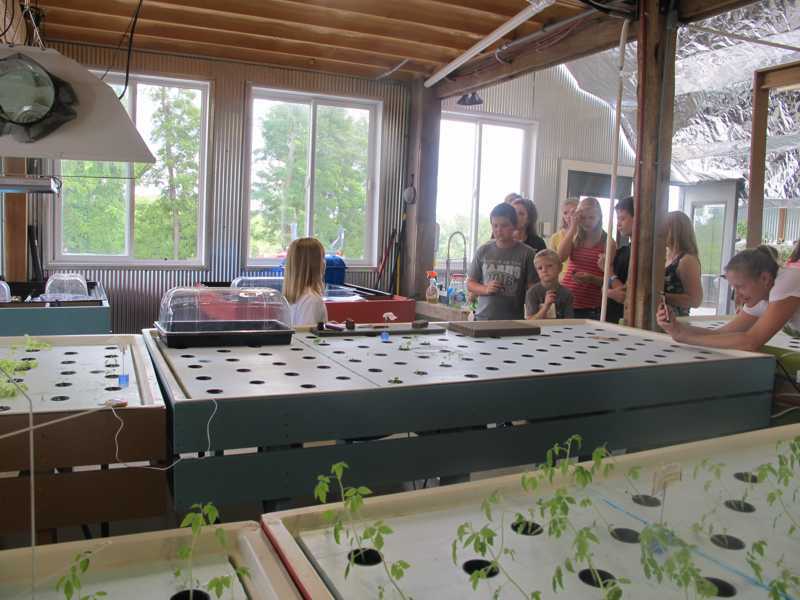 We learned a lot, including 3 different types of irrigation systems used there, the process of germination to harvest, and how the lighting & cooling systems are used to control plant growth. 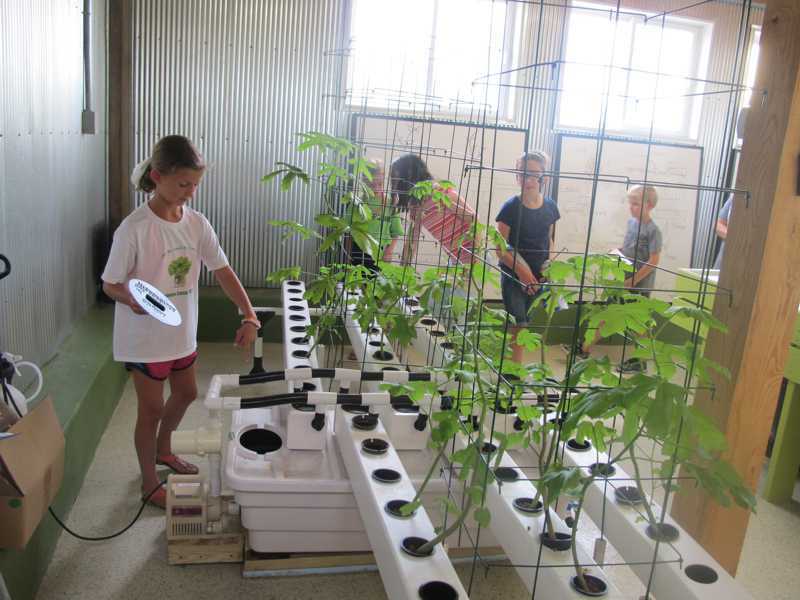 The kids on the trip put seedlings into the larger growth units & also could test the nutrient solution used with the plants. With the water/nutrient solution recirculation, this type of plant growth uses a lot less water than traditional farming! Testing the growing solution is very important for larger scale hydroponics. 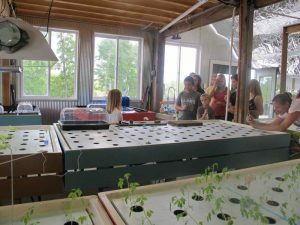 There’s a lot of innovation going on with hydroponics, including the addition of raising fish with the nutrient solution used for hydroponics (called aquaponics, there’s a lab down at South Putnam High School). Castlemakers also has a very small hydroponics unit at the makerspace. There’s been some interesting open source printed systems & Kickstarter projects for Hydroponic systems, projects anyone?